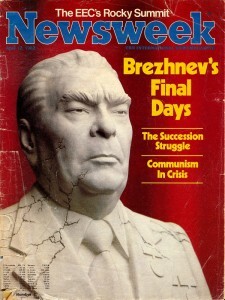 I dig deep in the family archives and picked up this April 1982 issue of Newsweek. We have two or three copies. The paper has already aged, it’s frail and has this characteristic yellowness of an archive document to it. There is also a Polish translation of one of the articles typed through carbon paper on an old typewriter. Ah! The material carbon copy. I think by 1982 it was already fine in Poland to have a copy of Newsweek at home; a few years earlier its discovery by the regime would have probably got you into some trouble. The mentioned article is a feature from Poland describing a day in life of one Polish family. But not just any family, my family! The little boy on the left in the picture (see below) is me, the other one is my brother. When I read this piece today, two things strike me. First of all, I don’t really remember any of that hardship. Our parents have done a great job to keep it off our minds. The second is the stark contrast of our lives today and how they were only 30 years ago. It makes me realise, the amount of change I have been trough in my life is nothing short of monumental. This is perhaps why I always accepted change as a natural part of life. Has the political revolution of Easter Europe left me with a grow mindset? Perhaps. I also have no doubt, this and other similar examples of my parents’ behaviours, have provided me with many practical illustration of what it means to be brave. While it might have been fine to have a copy of Newsweek at home, not many would have allowed a foreign journalist to cross one’s threshold, not to mention reporting on your situation in a capitalistic magazine. That’s why perhaps I always felt at-home with the five values of Extreme Programming and prefer to ask for forgiveness rather than permission. Needless to say, the journey of personal change continues. There is always something new to discover. Gosh, I think I read this back when it was published! Marcin, your parents are incredibly courageous. I imagine many people in Poland were, and that is how so many good changes came about. It sure makes me remember I need to value all the advantages and freedoms we enjoy. And of course, me being me, it makes me worry that as fast as things change for the good, they can change for the bad. I was an exchange student in Hamburg when that article was written. I remember a very interesting Polish student across the hall from me who was studying journalism and shared a little about the hardships of his own childhood. Resilience emerges as a character trait in those situations. It is wonderful that you have this article written about your family! Thanks for sharing.